Posted 23rd June 2016 & filed under Blog, Housing, Intergenerational Justice. House prices in London rose 14.5% last year, according to the latest release of data from the Office for National Statistics House Price Index. This figure once again demonstrates how London is largely a separate market from the rest of the UK, where prices only rose by 8.2% in the year to April (the average UK home now costs £209,054). 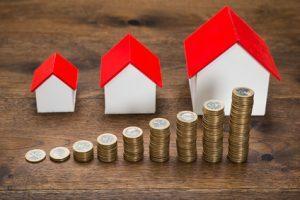 As has been the case for over two decades, the biggest cause of rising house prices in the UK market has been chronically low levels of housing supply, which, a recent parliamentary briefing paper pointed out, is still 50,000 units below the annual level required to match growth in the number of households. Housebuilding figures for the first quarter of 2016 were disappointing, leading some commentators to argue that the government’s official target of delivering 1 million new homes by the year 2020 has been rendered unrealistic. A recent investigation by the BBC delivered even more gloom for first-time buyers by showing that the government’s flagship “Help to Buy ISA” scheme – under which the savings of would-be first-time buyers will be topped up by the government, is unlikely to help the majority of young savers because house prices in most of the country are above the level at which government support is capped. Critics of the scheme have previously argued that it will only really benefit young people whose parents are wealthy enough to help them pay for a deposit or to let them live at home rent-free for this reason. One proposed solution to this problem has been to only allow people using the Help to Buy ISA to purchase very small properties, but a recent report by the Legatum Institute, Housing the Mind, about the mental health impacts of Britain’s housing crisis, argued that this would be a very bad idea as typical newly built properties in Britain may already be inducing higher levels of mental distress among their occupants on account of how small they are. Short of a possible post-Brexit recession, which some market experts have argued would cause lower house prices, positive solutions to the housing crisis still seem rather thin on the ground. However, one recent development has been positive, in IF’s view. The Housing Learning and Improvement Network (LIN), a quasi-governmental body which describes itself as “the leading ‘knowledge hub’ for a growing network of housing, health and social care professionals in England involved in planning, commissioning, designing, funding, building and managing housing with care for older people” has published a new report called Housing our Ageing Population: Positive Ideas (HAPPI 3) – Making retirement living a positive choice, which argued strongly in favour of there being more official support in place to encourage older people to consider how ageing will affect their housing needs. It particularly focuses on the issue of specialist retirement housing, and how older people can be encouraged to “right-size” as they get older, rather than staying in homes which are larger than they need and may become an unmanageable burden as they age. This is exactly the type of strategy needed to address Britain’s housing crisis, in IF’s view, as we have long argued that using our existing housing stock as efficiently as possible is going to be crucial to solving the housing crisis. We can only hope that the idea of “right-sizing” starts having more of an impact on official government policy in the near future than it has done up until now.